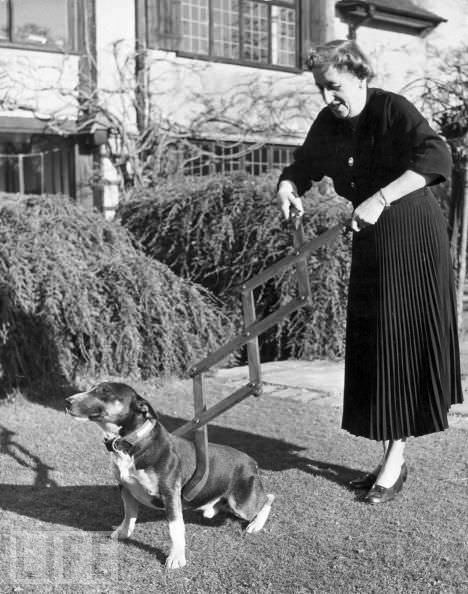 24 Silliest Inventions of The Twentieth Century | Do You Know? Let's look at how far can the human imagination go, when people have too much time on their hands. 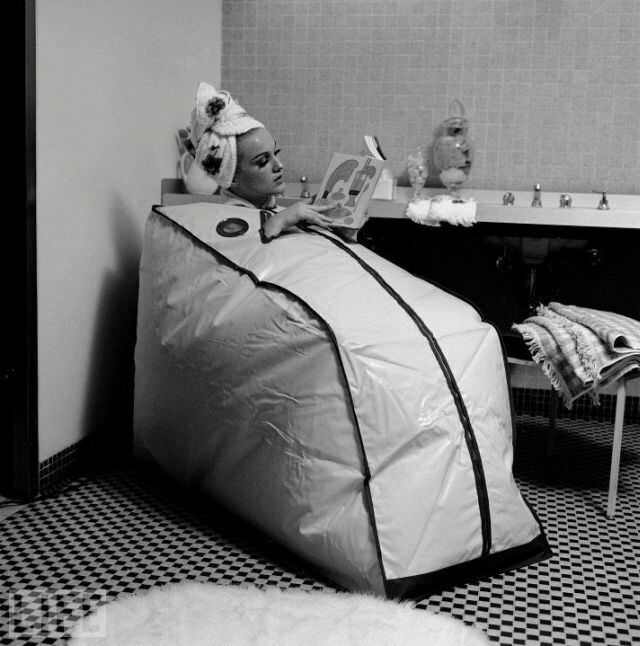 Maybe these inventions are not that stupid but the fact is that they are unnecessary. 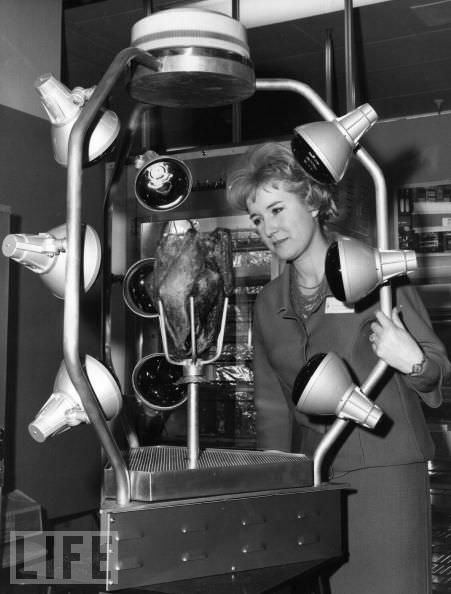 Well, it’s the human nature – always wanting to experiment and invent. 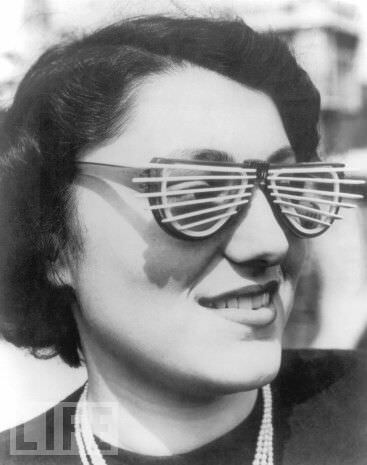 But we have to admit it's hard to read through this list of inventions without a few laughs! 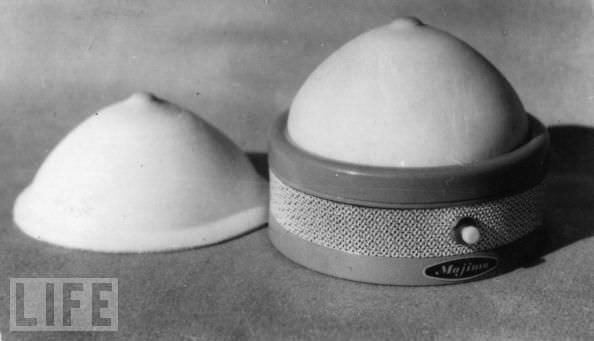 There were some people so crazy for dimples, that this apparatus was invented just for them. 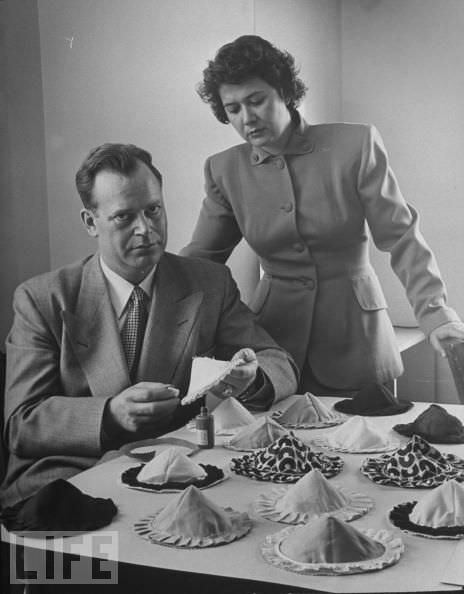 Charles L. Langs poses with his strapless, backless, wireless, support-less bras. His wife is justifiably dubious. 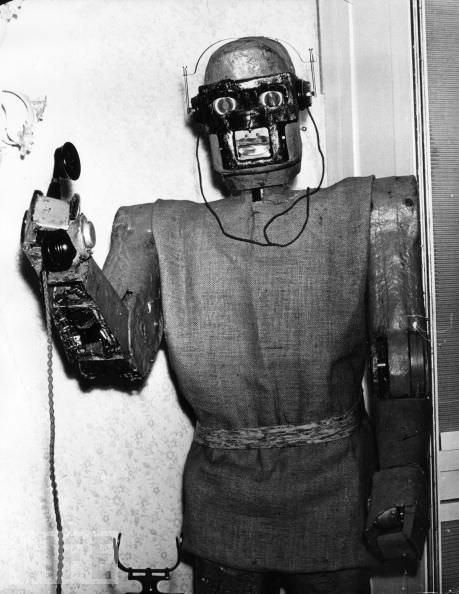 A robot designed by Claus Scholz of Vienna answers the phone, though it cannot speak. Halfway there, Claus. 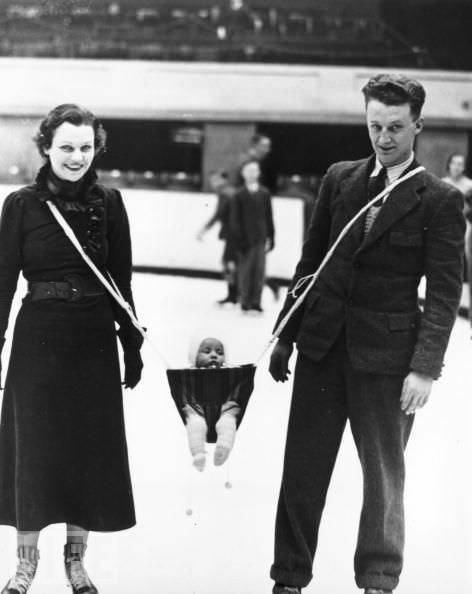 Jack Milford, player with the Wembley Monarchs ice hockey team, has invented a carrying device so that his baby can join his wife and himself on the ice. Mothers can rest or read while the antenna and radios are keeping their babies asleep. It was believed to be the best way to show your love! Can you imagine better proof of tenderness and love than sharing the same cigarette with your beloved one? 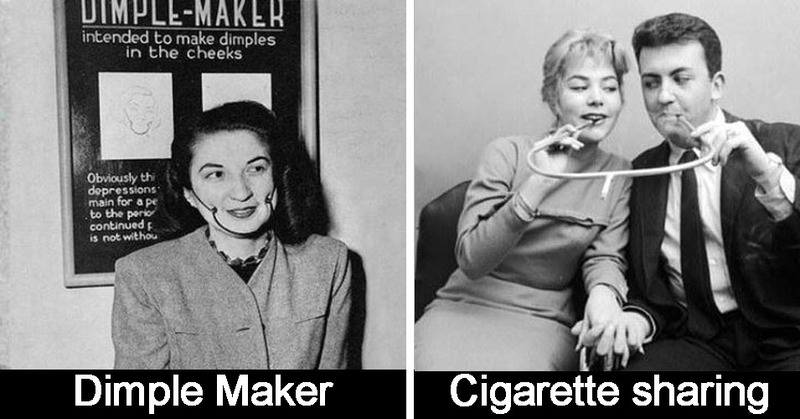 Once smoking was glamorous. With a Cigarette Pack Smoker it was 20 times more charming. What if someday you will need to cross a river to get to a meeting and all the bridges will be demolished? In such a case the Sea Shoes will help you! When you need to keep a poker face in the game. The roller shoes which run on gasoline, and hurts your wallet too! 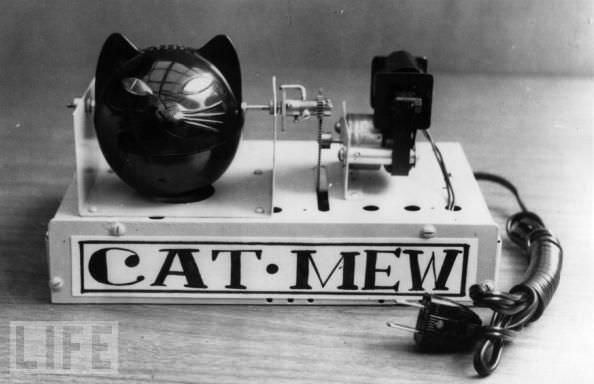 This mechanical cat can meow ten times a minute and the eyes light up each time. The device for scaring rats and mice is from Japan and is powered by a two-watt motor. Just because the original egg shape is so boring! 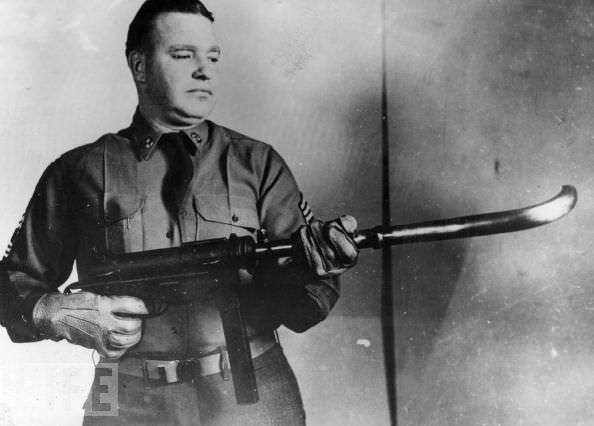 This M3 sub-machine gun with a curved barrel for shooting around corners. It's the perfect gun for the "shoot first, look where you're shooting later" kind of guy. 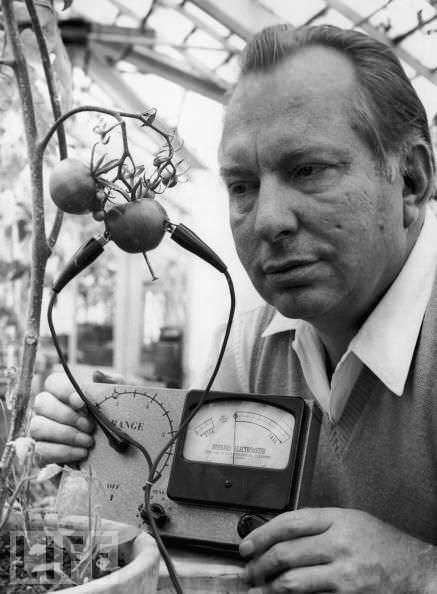 American science fiction writer and founder of the Church of Scientology L. Ron Hubbard uses his Hubbard Electrometer to determine whether tomatoes experience pain, 1968. His work led him to the conclusion that tomatoes "scream when sliced." 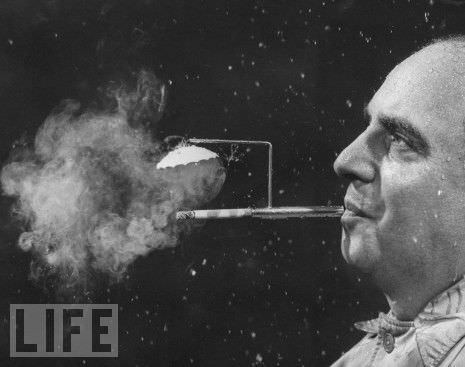 President of Zeus Corp., Robert L. Stern, smoking a cigarette from his self-designed rainy day cigarette holder. 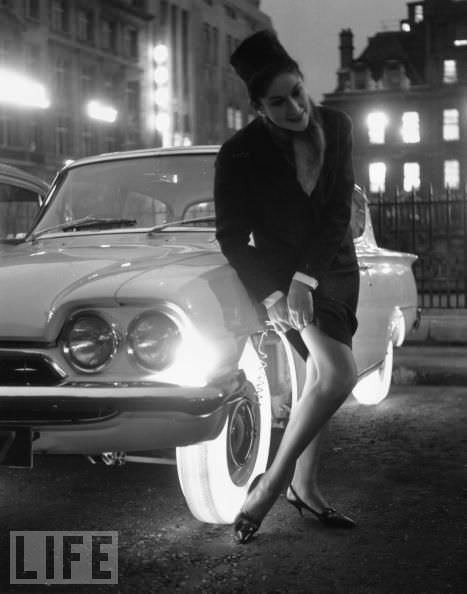 A woman adjusts her stocking by the light of the Goodyear's illuminated tires. The tire is made from a single piece of synthetic rubber and is brightly lit by bulbs mounted inside the wheel rim. For the woman who likes to put makeup on her dirty face. Birdman Leo Valentin demonstrates his method of flying from a special harness. 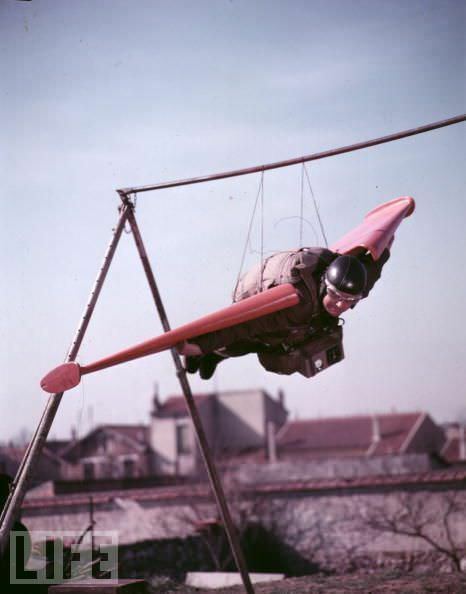 Valentin died when his invention failed him after jumping out of an airplane in 1956. When beauty gets converted to science. This is used to measure where the makeup should be applied.